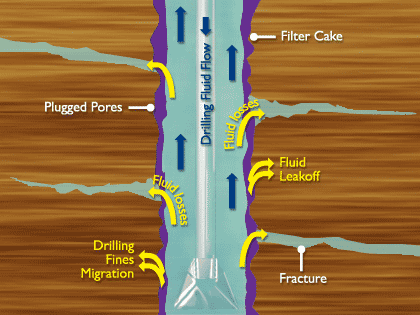 Lost circulation is a drilling problem where the drilling fluid is partially or completely lost in to the formation.During Loss circulation, Pit volume and mud flow out will decrease. Ideally while we are drilling, there should be very less decrease in drilling fluid volume which is required to fill the extra hole drilled.But in practice more volume of drilling fluid is lost while drilling, which is lost into the formation. According to severity losses can be classified as :- 1. Seepage 2. Partial 3. Severe 4. Complete Loss. In overbalance condition, hydro-static pressure of drilling mud is greater than formation pressure which pushes the liquid part of drilling fluid into the formation while the solids are deposited on the borehole wall and forms the filter cake which prevents further losses.The liquid part which is lost to the formation is called filtrate and the Losses while the filter cake is depositing across the borehole wall is termed as Spurt Loss. Drilling fluid Losses are avoided not only because of the cost of drilling fluid lost to the formation but also because of other problems it can cause. Formation damage, drilling fluid lost to the formation alters the permeability of the formation near the well bore which will reduce the flow rate of hydrocarbon during the production phase and may require well stimulation to improve the flow rate. Losses can also create well control situation. Due to losses height of mud column will fall and the pressure due to mud column might fall below the formation pressure this situation is called well control situation. Generally while drilling we face Loss circulation, if Losses are minor they can be neglected but Major losses requires treatment because the cost of drilling fluid is very high. Lost circulation can be treated in different number of ways based on their severity. Reducing the mud weight :- if the Borehole pressure is higher than the formation pressure it will push the drilling fluid into the formation and the losses will occur. So to avoid losses, mud weight can be reduced but slight overbalance is preferred to avoid well control situation. Designing the Drilling fluid with higher concentration of solid particles :- While the losses are occurring these solid particles will deposit on the borehole wall and forms a filter cake which will act as a barrier for further losses. Drilling fluid should be designed to deposit a thin (thick filter cake increases the chance of Differential sticking,low permeability filter cake to avoid losses. Pumping Lost circulation material(LCM) :- Lost circulation materials are solid particles which are mixed with drilling fluid to treat losses. Based on the severity of losses LCM size is chosen. Heavier losses will require bigger size LCM. Cement plug:- Cement plug is only used when the losses are sever. First the loss zone is located where the losses happening. Then the cement plug is set across this zone and after the cement plug is set it is drilled. This operation squeezes the cement into the fracture and when the cement sets it closes the fracture. Blind drilling :- Blind drilling is the term used for drilling without any returns i.e complete loss. If after using the above mentioned techniques we are still unable to get returns we go for blind drilling. Generally during blind drilling water is used as a drilling fluid to reduce the cost. Note:- Losses are monitored by Mud loggers and Pump Man and are observed by decrease in pit volume and mud flow out. If Losses are monitored they are first reported to the driller, than to Company and geologist.